Welcome to "Tree Tops", a cozy 3-bedroom Raised Bungalow for sale in Belize located at Better in Belize EcoVillage. Better in Belize is a 130-acre community nestled in the foothills of the Maya Mountains in Western Belize. This eco-community in Belize is located along a 5-mile lake with access to 3 majestic waterfalls. If you love kayaking, canoeing, hiking, bird watching and adventure, this property in Belize provides an unsurpassed location. It’s perfect for a Belize vacation retreat or year-round Belize home for a small family. Super Belize vacation rental property too! Ask us! This magical 130-acre community in Western Belize is 10.5 miles southeast of the village of Benque Viejo del Carmen. 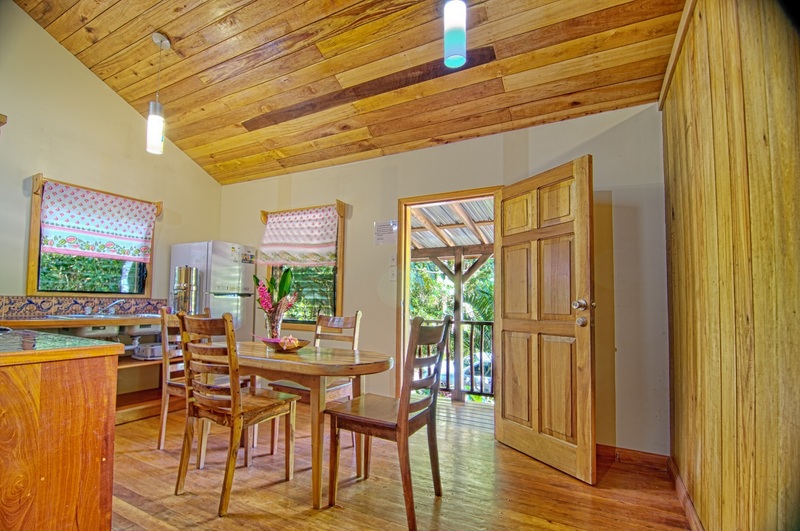 This quaint Belize bungalow features an open concept, bright, eat-in kitchen with double sink and open shelving. This Belize home is flanked by a full-length veranda at the front of the house – a perfect place for morning coffee and bird watching. Equipped with solar power, a rainwater catchment system, and eco-friendly Biodigester septic system, this 673 sq. ft. Belize cabin is a perfect size for sustainable living in the rainforest. Home does not include any chattels. 2. Over 75% of the lots in this Belize eco-community have already been sold. Don't miss the boat on owning affordable real estate in Belize. Grab this opportunity! Grab your chance to own this affordable home for sale in Belize! You won't find a deal like this every day! Talk to us to find out how you can buy this well-priced, 3-bedroom cabin in Belize. Financing may be available for qualified purchasers. Contact Veronica Cal, RE/MAX Belize Property Center at veronica@belizepropertycenter.com or use the form below. Call me direct at 011-501-678-9000 or call one of our team toll-free from North America at 1-877-836-2756. We can make your dreams of buying Belize real estate a beautiful reality!